Eugene R. “Goob” Rinker, 82, of Rural Streator, passed away Tues. Nov. 27, 2018 at his home. Funeral services for Gene Rinker will be at 11 a.m. Friday, Nov. 30, 2018 at the Elias Funeral Home. The Rev. Janet Proeber will officiate. Burial will follow in Grand Rapids M.E. Cemetery. Serving as pallbearers will be Ray Rinker, Austin Rinker, Brandon Swartz, Melissa Ritter, Kerri Augustine, Amy Russell, Annette Cherry, Christine Swartz, and Lis Schurman..
A visitation will be from 5-7 p.m. Thursday at the Elias Funeral Home. Born February 8, 1936 in Streator, IL he was the son of Raymond and Carrie (Kruger) Rinker, he married Mary Elizabeth Hall on April 5, 1956 in Ottawa. She passed away April 23, 2014.. He is survived by his children - Cathy (Larry) Troyer of Hudson, IL, Elizabeth (Al) Lieberum of Wichita, KS, Eugene (Debbie) Rinker Jr., of Streator, Trish (Henry) Swartz of Hudson, IL. Also surviving are grandchildren Melissa (Brian) Ritter, Annette (John) Cherry, Amy (Ben) Russell, Jennifer (Ronny) Love, Kerri (Andrew) Augustine, Andy (Whitney) Lieberum, Lis (Andrew) Schurman, Ray (Brittany Sampson) Rinker, Christine (Jason Grice) Swartz, Austin Rinker, Brandon (Raquel Penka) Swartz. He also survived by 14 great-grandchildren. He is preceded in death by his parents, wife, and a brother - Charles E. Rinker. He attended Grand Ridge Grade School and graduated from Streator Township High School in 1954. He was a Dairy Farmer, Grain Farmer, and involved in trucking for many years. He was a former member of the Grace United Methodist Church. 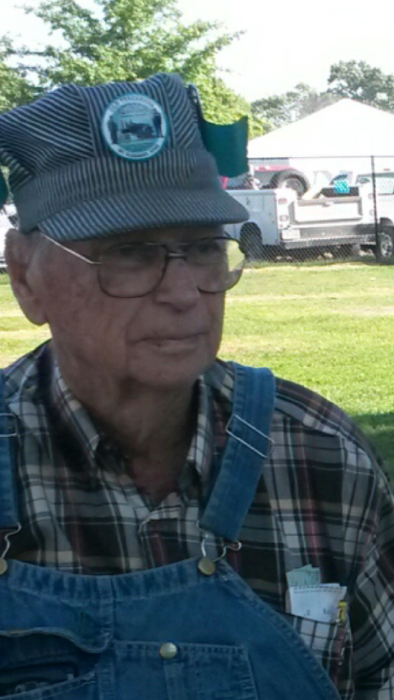 Gene was very active and enjoyed spending time with his kids and grandkids, camping, going to the fair, and trips to Mt. Pleasant, Iowa to attend the Old Threshers Reunion where he volunteered for many years. Memorials may be directed to Grand Ridge Volunteer Fire Department of the donor’s choice.